This distraction enough to reduce common cravings by 24%. Just three minutes of playing Tetris can reduce cravings for food, cigarettes and alcohol, according to a study published in the journal Appetite (Skorka-Brown et al., 2014). 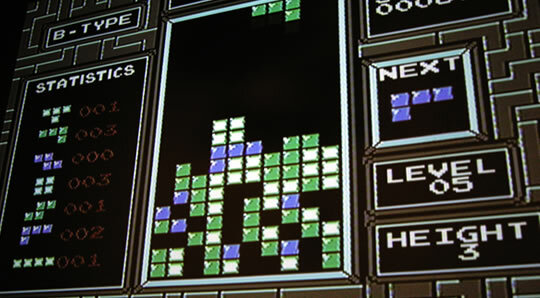 The psychologists conclude that Tetris, a retro tile-matching puzzle game (above), may provide a visual distraction which helps people control their cravings. In the study 119 people — whose natural cravings were measured beforehand– played the computer game Tetris or they were put into a control condition. The control condition involved waiting for Tetris to load, which it never did. What they found was that after three minutes of playing Tetris, people’s cravings had reduced by 24% in comparison to the control condition. Participants experienced less vivid, less frequent and less intense cravings for typical temptations like food, cigarettes and alcohol. The idea of using Tetris as a distractor is based on the theory that visual imagery is very important in cravings for food, alcohol and cigarettes, amongst other things. If the visual memory is busy with another task, then cravings are reduced because the mind’s capacity is limited. After further research comparing different types of computer games and different groups of people, the study may suggest an excellent way of helping people fight their cravings. “Feeling in control is an important part of staying motivated, and playing Tetris can potentially help the individual to stay in control when cravings strike. It is something a person can quickly access, for the most part whether they are at work or at home, and replaces the feeling of stress caused by the craving itself.